Après L’Ondée does to perfume notes what watercolours do to art. You can almost see the light coming out after the rain, you can practically feel it. Guerlain calls it “a perfume of absolute romance”. When I wear it, I can almost see Monet’s Les Nymphéas (Water Lilies), with their almost ethereal blues and purples and that feeling of cool fresh water. I love the cool earthy and buttery iris combined with the most delicately sweet and green violet, both of which are wrapped in the gentle powdery vanillic heliotropin that only Guerlain can do. I also notice a delicious anise note, which is kept from being too sweet or “licorice-y” by a whisper of gently soapy carnation and jasmine. Oh, to be sure there are other notes, but they are so masterfully blended I can’t really discern them. Many complain that Après L’Ondée is also heartbreaking in that it’s magical beauty doesn’t linger long enough on their skin. Luckily, my skin wears this perfume perfectly, and from the first second I sniffed it, I loved it. It does make me feel sad, but in a good way, the way a good cry during a sad movie does. It smells like a lush closed garden, at dusk, after a heavy downpour, when the flowers are heavy with water and weighed down, and air is still slightly electric, like the rain could come down again at any moment. Perfect. 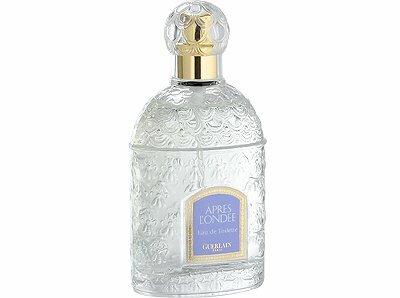 Guerlain Apres l’Ondee eau de toilette in the 100ml bee bottle is available from Guerlain Boutiques. Some department stores in the US with comprehensive Guerlain counters also carry it.